This is installment #6 of The Current State of the ART Market Series. ARTmostfierce's dear friend , fellow blogger and ART collector, MAO has few things to say about it too! MAO opinion is important as a season Art collector and his involvement in the Financial Market, a great combination for these series. Modern Art Obsession art blog was one of the inspirations for ARTmostfierce to create a blog. Lets see what MAO has to say! Ruben Natal-San Miguel- How long had you been collecting art? What made you start? MAO-MAO has been collecting art and photography for about 12 years. We've always been interested in art, but it was while working at Dreyfus Mutual Funds that we got to meet John Szarkowski from the photography department at MOMA. He helped curate their corporate art collection, and seeing the amazing photography collection in our offices got us interested and eventually totally obsessed about art collecting. RNSM- Modern Art Obsession is a pretty popular Art blog ...what is the main purpose behind it? MAO-The initial purpose of the Blog was for MAO to keep a record of all the art we liked, collected and experienced. But over time the Blog has become a great way for MAO to meet and interact with other art collectors, artists, and gallery people around the world. It's also become a fun hobby and an inexpensive way for MAO to contribute (in a small way) to the art world. RNSM- Has the Economic downturn slowed down your collecting ways? Has it changed the way you buy and what you like to buy? MAO-No.. We're still collecting at the same pace, and in the same way. But maybe our collecting dollars go a bit further today, and galleries are a bit more appreciative of our business than they were a few years ago. But clearly times are changing, it's amazing, today some galleries actually now say "Hello and Welcome" when people visit their gallery. RNSM- What do you like to collect the most? Painting? Photography? Sculpture? Drawing? There's no one "thing" we like most to collect. Our collection includes photos, paintings, drawings, sculptures, books, installations, etc..
MAO-We collect art that makes us think.. art that challenges the viewer, art that typically has multiple levels of meaning, and messages. RNSM- Do you think that some people in the Art establishment (like the fashion industry)are more concerned with appearances vs. who has the real desire of buying art and by being, lets say, artificial and plastic are missing out the real clientele? is there a lesson to be learn from it? I do!!!! 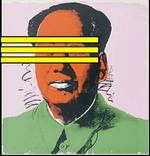 MAO-Saying, "one who has the real desire of buying art..artificial, and plastic" sounds like a judgmental question. And who are we to judge.. Judy!! MAO thinks collectors buy art for all sorts of reasons, and those reasons can change greatly over time. For each person it's a personal decision, and we think any person who buys a work of art is still helping support the art establishment, weather they learn from it or not. We've never liked the concept of a gallery discriminating between one collector over another, but, it clearly goes on. MAO doesn't think it's appropriate for anyone at a gallery to determine who's "real" or who's an important collector..and who's plastic and which collector is artificial. MAO believes that in an art gallery, open to the public, they should always treat each client with the same respect, and work on a fare, first come, first served basis. RNSM- You are involved with several non for profit organizations...is there anything that you would like to be done different regarding the sale of art works? MAO-MAO thinks the organizations we're involved with are doing a great job. Sadly, non-profits are going to have a difficult time the next few years. RNSM- Do you think that the prices of art works are currently coming down? Art Market price stabilization? MAO-Yes.. prices are coming down for most artworks. We're in a recession. The price of everything is coming down, real estate, stocks, Oil, NYC dinners, Broadway tickets, etc.. so should art prices. We've just seen the beginning of this art recession. It's going to be slow, and it's going to take several years for the contemporary art market to adjust to a more "normalized" price structure. RNSM- What would you recommend to someone who wants to start an art collection now during this economic climate? First, do your research !! Read..Read..Read!! Visit lots of Museums. Take your time. Talk to lots of other collectors. Start small and slowly. Second, buy only art works you love.. cause you're going to own them for a long time. Don't ever collect or buy a work of art, expecting to make money from it, or just because the price of the work looks cheap. Frequently, buying an art work cause it was cheap that you didn't love in the first place, will tend to end up in the back of the closet very quickly. RNSM- What kind of art media do you recommend to be more affordable to collect and why? MAO-MAO likes all art media. RNSM-From your professional experience, involved in business and the market...what is your opinion regarding the Art market with these current economic times ? Any suggestions for the Art industry? What do you think is going to happen next in the art business? Price re-adjustment? Discounts behind close doors? MAO-When MAO was in college, we always said, "The size of the hangover..is always commensurate with the size of the party!" Well.. it's been one long, huge art party the last 10 years! MAO's outlook is very gloomy, but sadly we think it's unavoidable at this point. The entire world economy is in recession.. maybe even depression. The rich are not so rich anymore. Many Billionaires from 2007 are not billionaires today. Many wall street, and hedge fund art collectors have been totally wiped out. Million is the new Billion... Small is back in style! We predict, some of these previously, "important" art collectors will be selling their art collections. MAO thinks the next round of art auctions in NYC are going to be very disappointing, possibly a total disaster, with less than 40% of the works for sale able to find buyers. This will occur, even with auction houses pushing down their pre-sale estimates as far as possible. Prices for most contemporary artists work are probably going to drop 20-50%. Art dealers are going to have to start reconsidering the pricing of their inventory..and the prices of new art work from their established artists are going to have to be brought down to be in line with these new auction prices. This process will take some time. Right now dealers are offering "discounts".. but that's going to evolve into the initial prices being lowered to more realistic levels. For example.. if a significant work from a working established artist, sells at auction for $20,000 at a big public auction house, how can a dealer price all the new work for much more? We expect this to happen to even the most important "Hot" artists working today. Several art dealers are going to shut down, probably at least 10 to 15%. We may even see some galleries merge together. Several artists are going to find themselves without galleries. Art fairs are going to get smaller. Museums and other Not-For-Profits are going to have funding problems. We're going to see more institutions selling parts of their art collections to raise funds for operations. MAO's suggestions to the art industry is somewhat darwinian, it's to adapt ASAP. Change your expectations. Cut costs now, Bring prices down now to reasonable levels. Now is the time to be innovative, but maybe it's not the best time to organize a pure concept show. But first and foremost, be vigilant in cultivating good client relationships, and providing high quality client service. The ones who adjust quickly to this new economy will survive, the others, well, they'll go the way of the subprime mortgage, and parachute pants. They'll be just a footnote in art history textbooks. RNSM- Are you seeking now to collect more emerging artist work than mid-range and established one? Why? MAO-We don't really "collect" emerging artist work. Any emerging art work we own, was more a part of the MAO philanthropic efforts to support new artists and galleries we appreciate. So, we do own some new young artists work..but, it's not the main focus of our collection. RNSM- Any artist that you haven't collected work yet? Can you name it? Why? MAO-There are only 40 or so artists in the MAO art collection. We preferred to collect artists work in depth rather than one of everything by everybody. RNSM- Do you consult with dealers, fellow bloggers, friends, partners or anybody before making an art purchase? MAO-YES. We talk to as many people as we can. And additionally MAO always consults with our beloved partner, Dr. Quiz, before we buy a major art work. Otherwise MAO has learned that frigid cold winds tend to blow through the MAO love nest household. RNSM- Do you think some art dealers need to do some re-adjustment with their attitude towards potential costumers? Why? Well.. actually.. MAO doesn't think attitude filled dealers need to adjust anything, cause these galleries who are not friendly, which cast negative attitude toward collectors and artists visiting their art shows..will probably be gone soon. MAO thinks, many art dealers do need to take a lesson from WalMart (the worlds most successful retailer in history). We find art dealers frequently forget, the CLIENTS are important to the business. Every gallery should almost have a professional greeter, standing out front saying.. "Thank you for coming..and if you have any questions, please don't hesitate to ask!" There's no cost in being nice, this is just common human curtesy, and sound business. RNSM- As an avid Art Collector what would you like to see right now in the art market? Better work ? Better prices? RNSM- You are quite an art book collector also...Do you recommend people be involved in book collecting as well? Why? You think it is a good time for it now? MAO-Yes.. MAO Loves Art Books.. Particularly, first edition, signed art photography monographs. It's a great way to learn about the artists and experience their work. Sometimes owning the photobook is better than owning an artists photograph. Many single photographs don't stand well on their own, the photobook is a complete thought.. a complete artistic statement. Today, is a great time to start collecting rare Art Books. Prices are already down at least 10-15%. We think these are undervalued art objects. With technology, and the digital age, books are slowly disappearing from our society. Most artbooks are published at an economic loss, and they frequently require donations to be created. In these difficult economic times, new high quality books are going to become increasingly rare. Additionally, auctions,and the Internet (websites ebay, photoeye, abebooks, etc) make it very easy to research, collect and trade art books. MAO thinks rare photobooks are a great way for young collectors to start. They are at a much lower price point, so very affordable, and they are easy to store. Plus they bring a little bit of the art museum into the collectors hands! Each art book is like a mini-art collection, and clearly we can't get enough of that! RNSM- Any final thoughts MAO? MAO-YES.. for all those eager young artists (and gallerinas) reading this blog who are very interested in having their art work featured in the MAO Art collection... we we have a very liberal donation policy. Please contact Dr. Quiz for shipping instructions. I use to like your blog. But, Mr. MAO is the Grim Reaper of the coming Art Apocalypse. How could you post an interview with that over paid Wall Street Hustler? MAO is a very hard working New Yorker like most of us and a great informer and patron of the Arts. The series is going to have different angles and opinions. Even if my opinion might differ from most of people I interview for these series, I might not be doing my job by providing their straight answers. There is more coming, about 15 more people and you might like the ohters better. Stay tuned and chin up! MAO is a very bright guy... and I've found him to be honest and most of the time 100% correct. People should have listened to MAO last year....when he was telling everyone the art market was going to crash!! If the people at Roebling Hall Gallery had listened to MAO..maybe they would still have a gallery space today!! MAO maybe dramatic at times but he's not exaggerating. He saw this gloomy scenario looming like a dark cloud. MAO can't put a positive spin on the economy and the art market bec it's scary as hell. We haven't hit rock bottom yet. The cascading unemployment and home foreclosures are staggering. 2009 will not be prosperous year. More galleries will close no doubt. The fittest survives. Fasten your seat belts, it's going to be a bumpy ride!